Posted April 19, 2017 by Martin Slater & filed under Services. A long-standing customer had a hit series with good activity but poor properties. Cresset Discovery Services worked closely with the customer to formulate a plan of action to optimize the compound properties while maintaining potency. Cresset Discovery Services has worked closely with a customer on a target. We ran virtual screens, aligned literature chemotypes and proprietary chemotypes in order to arrive at a robust binding hypothesis and a field hypothesis. This enabled the customer to find a new chemotype that had good activity at the target. However, the hit series had poor properties. They needed to optimize the compounds, potentially sacrificing some potency while balancing this against improving the properties of the molecules. The target in question required lipophilic molecules, so the set of compounds had reasonably high lipophilicity which can be a liability in drug development. The compounds also had high protein binding and, we suspected, high clearance. Figure 1: Forge radial plot. The selected ‘highlighted’ set (Figure 3). 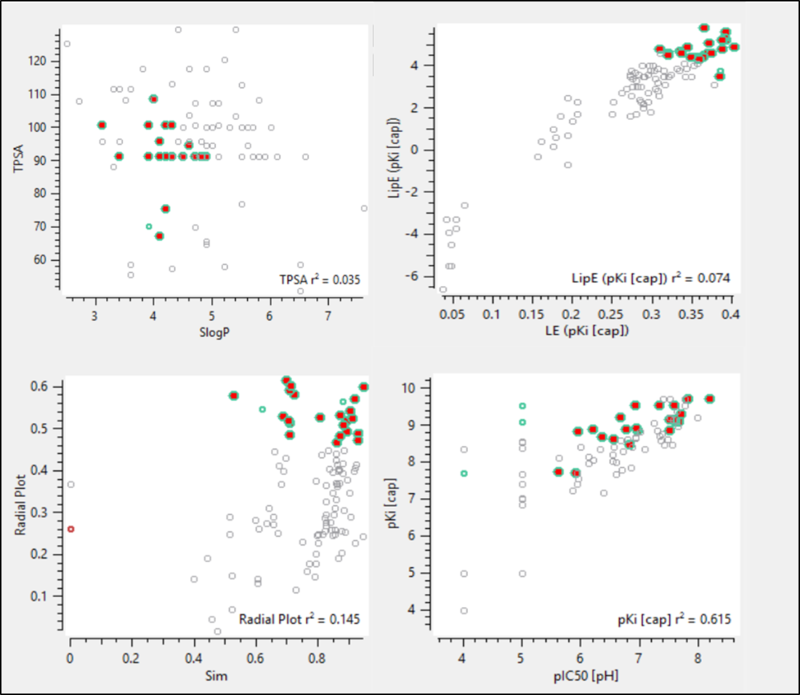 Compounds with better properties give a larger area in the radial plot. Figure 2: Forge graphical radial plot parameters. For each property a function is used to describe perfect, acceptable and unacceptable values. 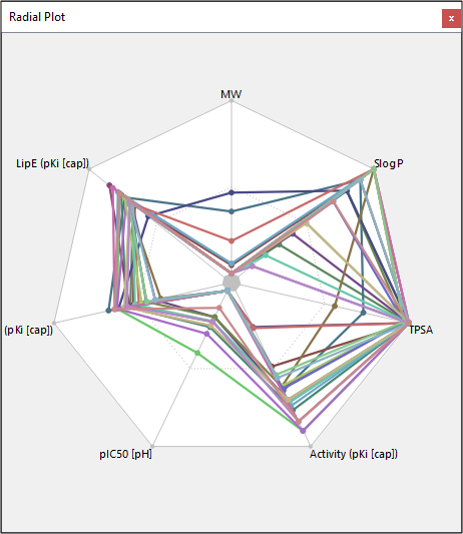 Perfect values are plotted at the edge of the radial plot and unacceptable plotted at the center. A single ‘Radial Plot Score’ is created to represent the fit of a compound to the chosen set as a function of parameters using the specified weighting scheme. Figure 3: Forge property plots. 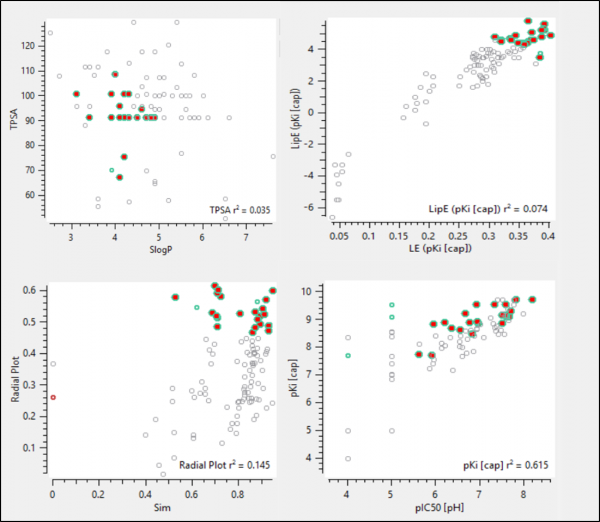 Radial plot scores as a MPO method: Compounds with a radial plot score greater than the chosen cut-off (bottom left) were selected and hence are highlighted all the plots. These compounds have a good balance of activity and other physicochemical properties. The best course of action for optimization was to search for compounds that were reasonably active but far more polar than the bulk of the molecules in the compound set. We designed suitable variants of these candidates and checked them using the alignment model in field space that we had developed earlier in the project. New combinations of functional groups on the core were selected to address the overall lipophilicity whilst maintaining the essential interaction features. 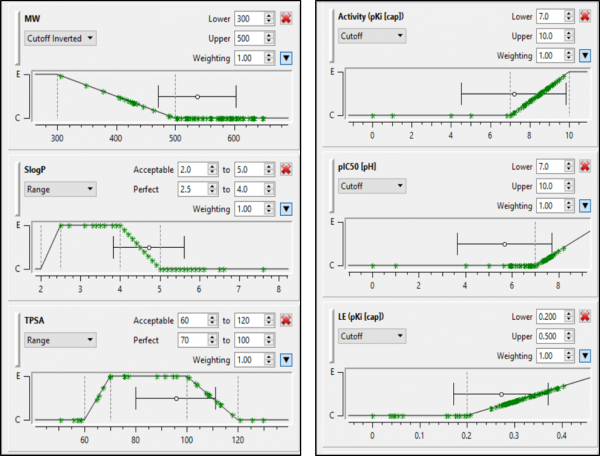 This solution had the potential to address both the protein binding and clearance issues. Over the course of the following weeks the customer worked through these ideas with a high degree of success. We collaborated closely with the customer throughout the project. They shared not only their activity data, but also their property data. 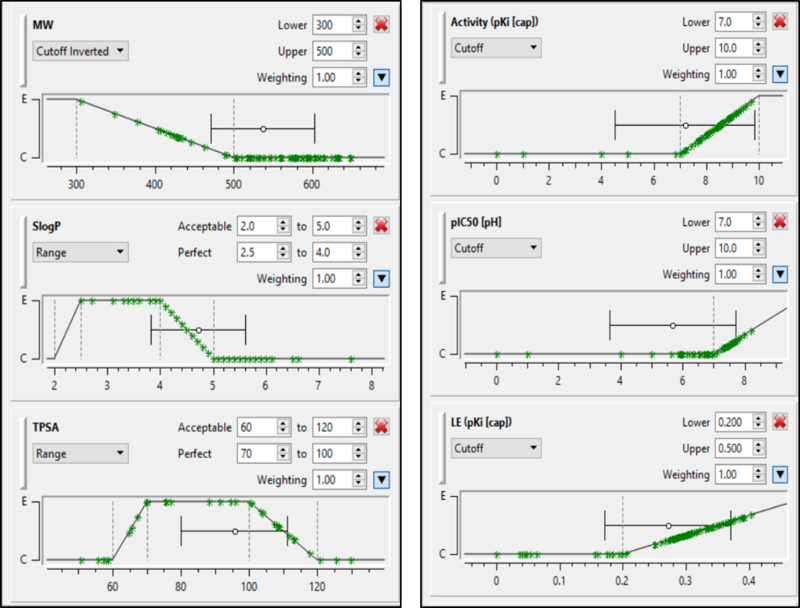 We assessed both the activity and property landscape, and refined the suggested sets with the aid of multi-parameter optimization, which enabled us to suggest which compounds they should make and progress to help to get them past the hurdles they were experiencing. The customer has now arrived at a set of compounds with far better properties without a significant loss of potency. The customer has retained our services to help them to optimize the potencies of the back-up series, which may help them to choose which chemotypes to progress next. Contact us to see how we can help you with similar projects.